Considered one of China's great classical novels, Wu Ch'êng-ên's Journey to the West was translated by Arthur Waley in abridged form as Monkey in 1942 and has delighted English readers ever since. 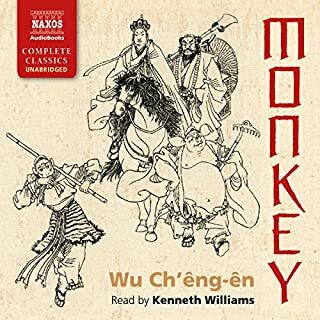 It is a riveting adventure story about a priest's quest to obtain holy Buddhist scriptures for the Tang emperor; joining him on this rollicking journey: Sandy, Pigsy, and the mischievous monkey king, Sun Wukong, whose flying cloud and magic cudgel are never far from his infamous deeds. What did you love best about Monkey? Journey to the West is a Chinese novel published in the 16th century during the Ming dynasty and attributed to Wu Cheng'en. It is one of the Four Great Classical Novels of Chinese literature. Journey to the West has strong roots in Chinese folk religion, Chinese mythology, Taoist and Buddhist philosophy, and the pantheon of Taoist immortals and Buddhist bodhisattvas are still reflective of some Chinese religious attitudes today. Enduringly popular, the tale is at once a comic adventure story, a spring of spiritual insight, and an extended allegory in which the group of pilgrims journeys towards enlightenment by the power and virtue of cooperation. Which character – as performed by Kenneth Williams – was your favorite? Kenneth has a great narration here.